CAMP TAJI, Iraq –For two Apache Longbow pilots, the night of Oct. 16 was just a regular night flying a reconnaissance mission around southern Baghdad. A distorted cry for help came across the emergency radio shattering the chatter of all other communications. They recognized the call sign, they recognized the area and a few minutes later, they were in route to perform what would become a heroic rescue. “I really couldn’t make out at first what was going on. The transmission over the radio was broken up and weak, but I could make out that it was a distress call,” said Lodi, Ca native Chief Warrant Officer Justin Taylor, an Apache pilot, with Company C, 1st Battalion 227th Aviation Regiment, 4th Brigade Combat Team. At first, the transmission seemed as though it might be coming from U.S. Marine Corps aircraft. The call sign speaking to the downed aircraft was of Marine Corps designation Taylor said. He radioed to Marine Corps headquarters asking if any aircraft of theirs was down in the area, to which the response came back negative. Then a call sign familiar to Taylor and Capt Ryan Welch, the air mission commander, came across the guard, or emergency channel. As the team changed flight paths they notified the USMC aircraft of their intention as well as calling back to 4th BCT headquarters to alert them to their movement. When they arrived on station they began trying to contact the pilots on the ground. “As soon as we told the Marines what we were doing, a call came up on the guard channel, it was the same call sign but a different numerical designation,” Welch explained. The wounded pilot explained that the previous pilot was unable to respond, that two pilots were killed in action and that he and the other survivor were trying to make their way to a defendable position but having difficulty as one of the wounded was unable to walk. “When we flew over the sector, we immediately picked up the heat signature of a burning fire,” said Welch. ...for a new blogwar for Spirit of America (Okay, so SOA likes to call it a "Blog Challenge", not a war). 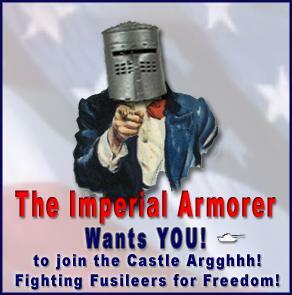 Once again, the Donovan is gathering the Fighting Fusileers to raise $$$ for the very worthy Spirit of America. We helped to raise over $50,000 in the last challenge. We are joining the Blog Challenge late and are far, far behind in donations. So, go here and donate to the Spirit of America. Your donations are tax deductible. While I have been accused of even-handedness when posting about the different branches of the military, there comes a time when the rivalry returns, when I have to take a shot at the Navy...and that time will be at the kickoff of the Army-Navy Game this Saturday. I'm a mustang and didn't go to West Point, but I remember a few years that I was overseas where everyone - Enlisted or Officer gathered round to watch the game. I've been to a few of the games in Philly, too. 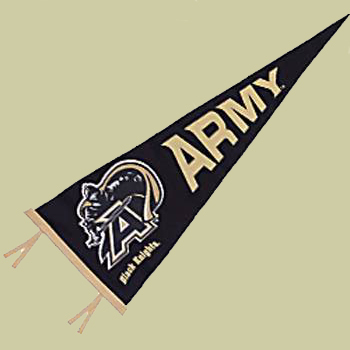 Now, there is no doubt that the Army team is on the way back from the worst record in College Football history. But if they defeat Navy? Well, then, Sailors will be crying the world over, crushed and defeated by one of the worst teams in football. And that, my friends, is a worthy endevour. Patrick M. sends the link to Sports Illustrated's fan poll for Sportsman of the Year. Background: Sports Illustrated is conducting it's annual fan poll for Sportsman of the Year. This year there is one athlete who stands out. Tim Layden of CNN/Sports Illustrated lays it out for you. 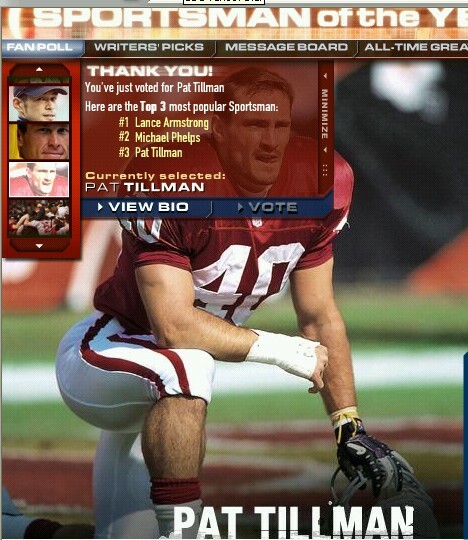 I'd appreciate it if you took some time to go here to vote, select Pat Tillman on the sliding window on the left of the site (he's second from the bottom and wearing a red football jersey), click on his picture, then hit the vote button. Just in case you have trouble finding his picture, here is a screenshot of what Pat Tillman's ballot looks like. Currently, he is in third place behind Lance Armstrong and Michael Phelps. Update: Sondra K. says that she can't think of a more worthy person. I agree. In case you didn't know, Wizbang is hosting another year's Weblog Awards. First, you nominate a blog by posting a comment with the blog title and URL in the appropriate category. You can find the categories and post nominations here. For the first time, there is a MilBlog category. Go and nominate your favorite MilBlog. Nominations close tomorrow so be sure to nominate your favorite blogs in each category. After nominations close, voting will commence on December 1st. Last year, Blackfive came in third for Best New Blog (behind Healing Iraq and Allah Is in the House). Didn't mind losing at all as this blog was in pretty good company, right? Angel M. sends this USAToday/Army Times story about soldiers that drove through a car bomb and possible ambush to get turkey to their fellow soldiers. It has a lot of comments from the troops, too.